Windows 7 has a few tools you can use to peek at programs and services that run automatically at startup or logon, most notably the System Configuration utility, Msconfig. But that built-in tool pales in comparison to the undisputed heavyweight champion of the category. 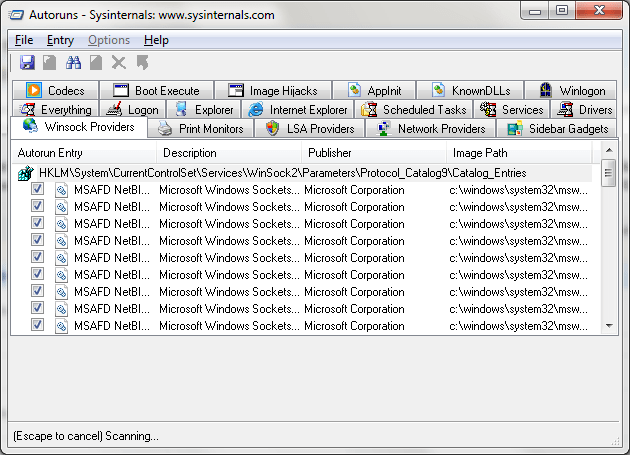 “Autoruns” Tool, which is available for free from Windows Sysinternals monitors programs in your Startup folder and in registry keys, showing you the exact order in which those programs will run. You can also configure Autoruns to show Explorer shell extensions, toolbars, browser helper objects, Winlogon notifications, and auto-start services, among other categories. Shortcut menus allow you to search for more information about a process or service whose name is unfamiliar, and clearing a check box to the left of each entry disables that item. The Everything tab shown here gives you an unfiltered look at everything your system starts automatically. Posted in Microsoft, Tools and tagged technet, Tools, Windows 7. Bookmark the permalink. the Autoruns tool is not limited to Win7 only. it works with even windows 2000. Yeah Sudesh. You are right..! , Writing so many win 7 articles, every thing I write for Windows I tag it as Win 7 😉 Apologize for it 🙂 he he..!